No Trick, FRANKENWEENIE is all Treat! 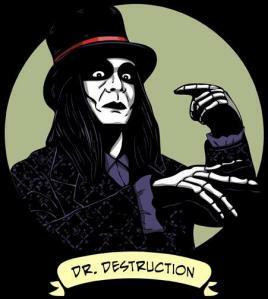 Review by DR. DESTRUCTION! I became a fan of Tim Burton early on because of THE Nightmare Before Christmas and ED WOOD which came out the following year. I anticipated every thing he did after that but never did he seem to match that initial first impression I got from those two films. I had learned after that he had been responsible for PEE WEE’S BIG ADVENTURE, BEETLEJUICE, and EDWARD SCISSORHANDS. 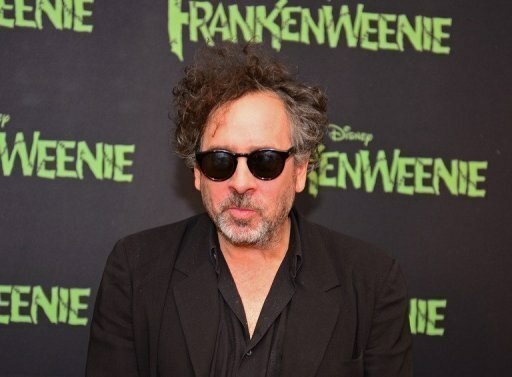 FRANKENWEENIE has brought me back to that “Spark” that made me such a big Tim Burton fan. One could almost see this as the next film after ED WOOD, at least that’s how I see it 18 years later. With the “boy and his dog” premise mixed with Frankenstein, Tim delivers what could be his best yet! We are suddenly back in the suburbia that one might expect to see Scissorhands cutting the hedges or Bela Lugosi picking a rose in. It’s not surprising that Martin Landau (who won an Oscar playing Lagosi in Burton’s ED WOOD) is the science teacher that gives the inspiration for young Victor to revive his dead canine, “Sparky.” The beautiful high contrast black and white and pacing of the film are perfect. The film is sentimental while also paying homage to the classic genre. the movie goes by quickly for what I believe is the longest running example of the stop motion films. Sparky, dressed as a dinosaur, even gives the classic stop motion dinosaur head scratch. The characters resemble Universal greats Egore and a very Karloff-esque figure that gets wrapped up as a mummy! 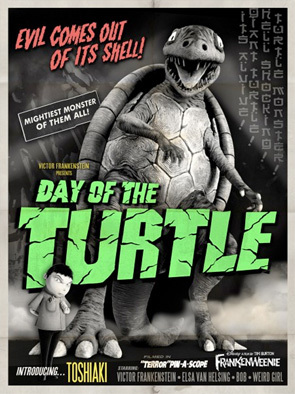 We even have a giant turtle monster that fans will instantly recognize as a nod to Gamera! The menacing reptile is even seen smashing a car like the Tri-Star American GODZILLA (yeah, the awful one featuring Matthew Broderick a.k.a. Mr. Sara Jessica Parker). With that single car crushing, Burton successfully stomps that shoddy Godzilla;la movie and does more with his giant monster in 10 minutes than the 98′ Godzilla did in a n entire film. Overall I was overwhelmed and impressed! It has been so long since anything this good has come out. Put simply; FRANKENWEENIE rocks!!! One final note: the previews, which were all in 3D, were dazzling for me. 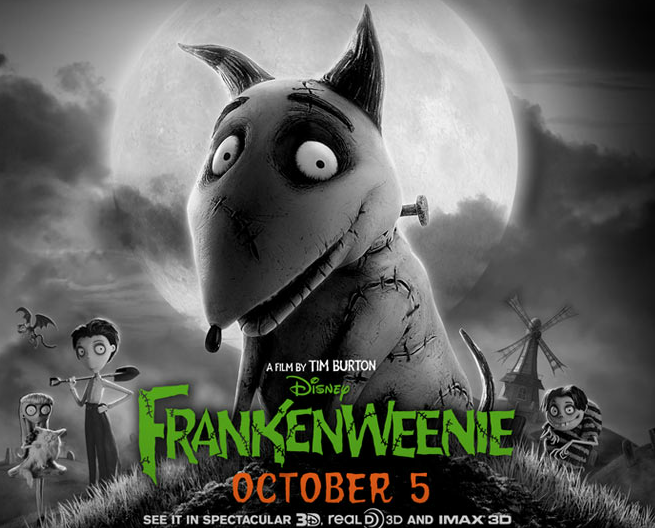 I’m not sure if FRANKENWEENIE really needed to be in this format and you can certainly enjoy it in 2D. I also wondered how many kids would be entertained by the references to movies they probably have never seen. I attended the film with The Crimson Theatre’s Rebeka Pretorious, She being from another generation was not as impressed as I. 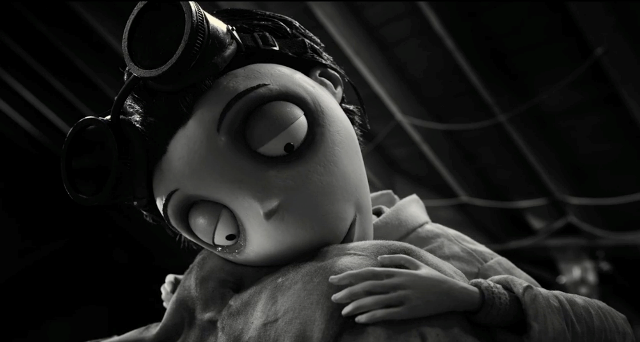 But, from my monster perspective, I am glowing in the satisfaction that FRANKENWEENIE has given me (gee that sounds weird). This entry was posted in Movie Reviews and tagged Bela Lagosi, Ed Wood, FRANKENWEENIE, Universal Monsters. Bookmark the permalink. ← Shock Theatre, Chicago Style: WBKB-TV’s Late Night Horror Showcase! I have to agree with you – Nightmare Before Christmas, Ed Wood and his earlier stuff is brilliant, and I was more impressed with them than his more recent films. 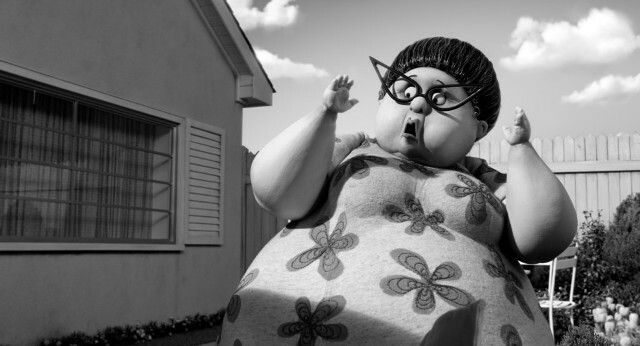 Frankenweenie is great.